With the exception of Luddites and perhaps the Amish, everyone, it seems, is on the Internet and social media. But no; there are holdouts. In a recently released Spectrem Group wealth level study of non-Millionaire Main Street investors, 20 percent indicated they do not frequent social media sites. The highest percentage, 54 percent, eschew social media as a waste of time, while just over half (51 percent) indicate concerns about privacy. 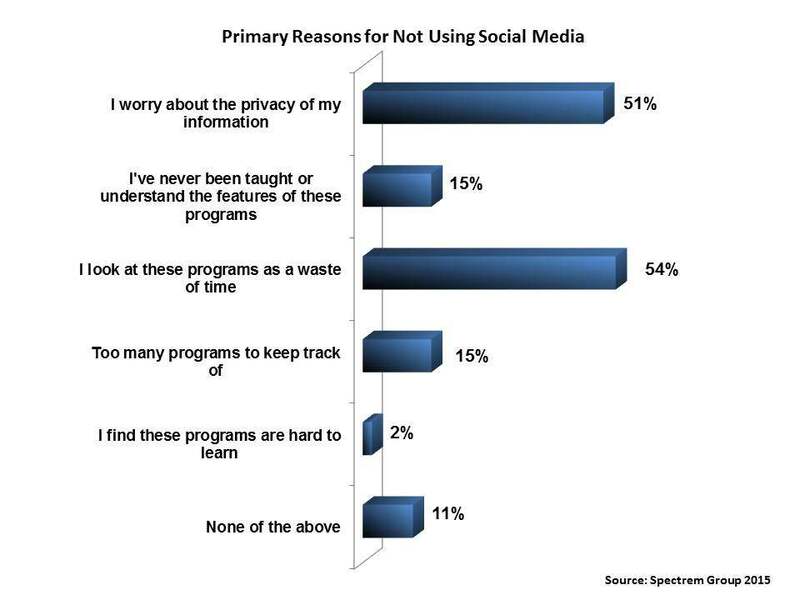 Fifteen percent said they have never been taught how to use social media or fail to understand these programs’ features. The same percentage sees no value in the purpose of these programs. Surprisingly, age is not a factor in social media avoidance, Spectrem Group research finds. Conventional wisdom has it that young people are Internet proficient and dependent. But half of the surveyed Main Street investors under the age of 35 who do not use social media indicate they do not do so because they consider it a waste of time. That is on par with Baby Boomers ages 54-65 (54 percent) and seniors (53 percent). The most adamant of respondents who believe social media to be a waste of time were those ages 36-44 (64 percent). Among Millennials, that is their only stated issue with social media. Otherwise,they seem to totally get it. None expressed concern about privacy, or stated that they saw no value in the purposes of these programs or that they had never been taught how to use them. As to privacy, nearly six-in-ten of respondents ages 36-44 were most concerned about this issue, compared with roughly 54 percent of their elder counterparts. A 2014 Pew Research study marking the 25th anniversary of the Internet found that social media would be the easiest technology to give up. Only 10 percent said it would be hard to do without, compared with 46 percent who said that the Internet itself would be very hard to give up (44 percent indicated it would be very hard to give up their cellphone).